Chair-making was one of the early specializations of furniture - making. In the 18th century, Windsor chairs or stick-construction was adapted to a type of mass - production  the components of the chairs could be made in quantities and then assembled. There was a tendency to keep chairs in stock for the customer to select, rather than executing custom designs, as in the case of beds or chests. Since the other Hatches, presumably his parents and brothers, were still living in one-storey log and frame houses in the mid-19th century, one wonders where the money came from to finance this venture and who the company was. A month after his first advertisement, Chester specified his interest in painting: PAINTING. All Kinds of Ornamental Painting, gilding, and Varnishing done with neatness by the subscriber, at his shop over Mr. George H. McLeans store; all persons wishing to have Sleighs, Signs, Chairs, etc., painted, must call within three weeks from the present date, as he will take in no work after. Copal varnish, and some other articles in his line for sale. CHESTER HATCH 1815. He had evidently needed to diversify from chair-making, and clients might wish, to have their sleighs and older chairs brought up-to-date with fashionable painting. He had decided to move from George McLeans premises, and perhaps that is why he h to limit the amount of work received. At this early stage in his career, clients may locate him by referring to a better-known merchant, such as McLean, but it will not be many years until younger merchants refer to the Hatchs establishment as their landmark. One might speculate that Chesters key to success was his flexibility, necessary in a town of modest size, and his recognition of current trends, necessary with the fickle tastes of the people who could afford to patronize him. Competition from other woodworkers, both locally and in the larger centres of Montreal and the United States, no doubt also kept up his awareness. Hence we find him advertising Waterloo chairs, soon after the 1815 defeat of Napoleon. This was the new name for the splayed, concave legs, also called sabre of scimitar, of the Greek klismos chair, revived during the Regency period in Europe. He has now added bureaus and settees, as well as glass-cutting, to his business, but the main emphasis will remain on chairs. These advertisements should seal the demise of two favourite and conflicting myths of the amateur antique collector: firstly, that furniture was ex posed to the raw wood, now produced by scraping off Ornamental Painting and, secondly, that old paint was always made of butter or skim milk and the blood of an unfortunate ox. 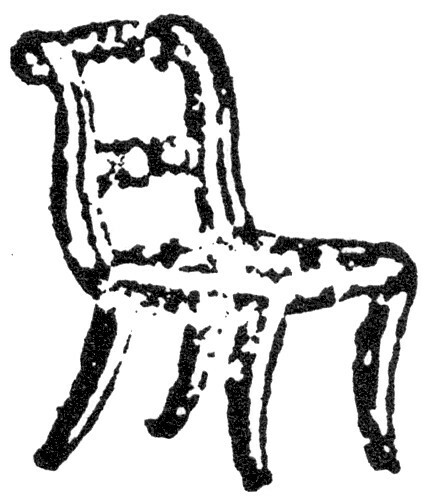 In 1817 and 1818 he offers the following types of chairs: elegant, broad-top, ball-back; fancy and Windsor bamboo-turned; fancy and Windsor slat-back; real cane seat; Waterloo; Common (probably ladder-back); Rocking and Childrens. These, he assures the public, are WARRANTED GOOD and are superior to any they have hitherto offered for sale. The latter statement one would think would hardly be encouraging to their old customers, but Hatch was out to hustle business and noted that he would accept country produce for payment. Cash was sometimes difficult to collect due to a scarcity of coinage. Cabinet ware could also be purchased from the Princess Street Store under the same conditions. However, his loyalties are with Kingston and he marries a local girl, Ellen Conklin (1804-1880), in 1825. She was 21 years old, and over the next 19 years would bear him six. children. 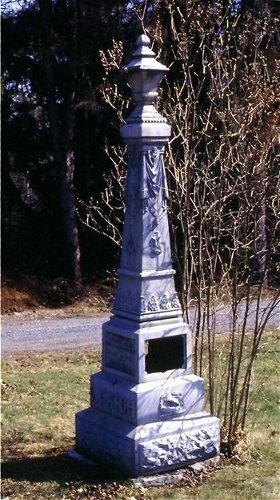 Their eldest son, Wilson, was born in 1826 and in the 1840s is noted as a Chair Maker of the town of Kingston. In 1849 he advertised: CITY CHAIR FACTORY. Wilson Hatch will sell at wholesale, 10 per cent cheaper than any importer. This brief notice indicates the stiff competition individual furniture makers were feeling from the large factories of Britain and the United States. The era of local production catering to local tastes, in which Chester had started his business, was drawing to an end in the Victorian period. 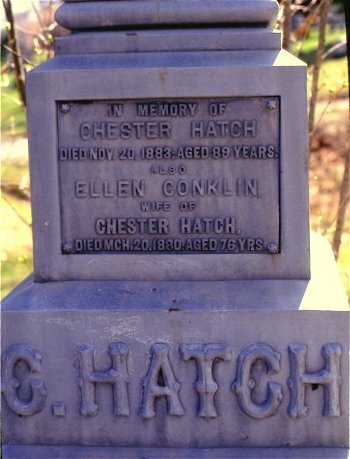 However, with earned smugness, Chester could report to the census-taker of 1861 that he was a Modern Gentleman who lived in a three-storey stone house with his wife, Ellen, and four of his six children. His sons, Wilson and George, were away in California, presumably seeking their fortunes. An Irish servant and three men lived with them in the house and five-storey stone shop, now rented out to various tradesmen. Chester had retired in 1857 (reported in the 1861 census), and could report that in his 42-year career, he had had an annual manufacturing of 4,500 chairs. In 1816, a youthful Chester hoped that the public would sufficiently encourage the company to continue and, by 1853, Chester, a middle-aged, charitable, Congregationalist businessman, was voted in as a member of the recently formed Board of Trade whose selected members represented the successful entrepreneurs of mid-19th century Kingston. 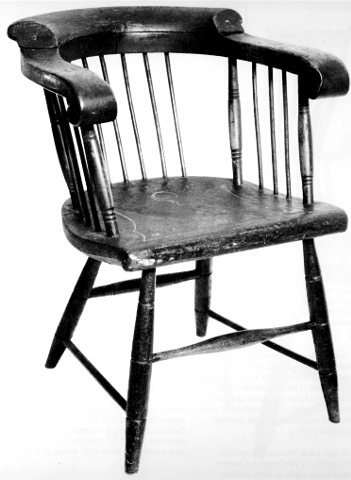 right: Low-back Windsor armchair, stamped Hatch, from Kingston, and illustrated in Howard Pain's The Heritage of Upper Canadian Furniture (1978) as number 252. See also figures 281 (arrow-back sidechair), 372 (sidechair with woven seat), and 743 (Windsor cradle). On pages 76-7 and page 123 of Joan MacKinnon's Kingston Cabinetmakers, 1800-1867 (National Museum of Man Mercury Series, History Division Paper No. 14, 1976), a Hatch arrowback sidechair, a "chickencoop" sidechair and a cane-seat sidechair are illustrated. Further details on Hatch's life are described in this book.